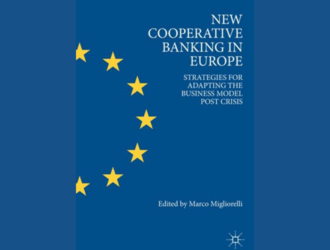 A new book titled "New Cooperative Banking in Europe. Strategies for Adapting the Business Model Post-Crisis" has been published on 1st September 2018. It is edited by Marco Migliorelli, researcher in finance at the IAE University Paris 1 Panthéon-Sorbonne and hosts contributions from important scholars active in the co-operative banking field, including Hans Groeneveld (TIAS Business School and Rabobank), Eric Lamarque and Géraldine Michel (IAE University Paris 1 Panthéon-Sorbonne), Eric Meyer (University of Munster), Roberto Di Salvo and Juan Lopez (Federcasse), Silvio Goglio and Ivana Catturani (University of Trento), Simon Cornée (University of Rennes), Giorgio Caselli (Cambridge University). The volume offers an independent, in-depth academic view on how the European co-operative banks have continued to evolve amid the new competitive scenario that resulted from the Global Financial Crisis. It shows how the co-operative banks, axed on the unique principles of membership, democratic governance, proximity, commitment to social values, have faced new challenges such as exceptionally low interest rates, low profitability generated by traditional banking services, the entrance of fintech companies into the banking market and, last but not least, tightening regulation producing an increased capital, liquidity and governance burden. While discussing these challenges, the volumes highlights the crucial role of cooperative banks in serving the real economy and in particular small and medium enterprises. Finally, the volume offers a debate on possible future opportunities for co-operative banks raising from embracing the sustainability movement, rethinking proximity in a digital world, improving the way the cooperative difference in banking is communicated, leveraging the relationship with fintech companies.